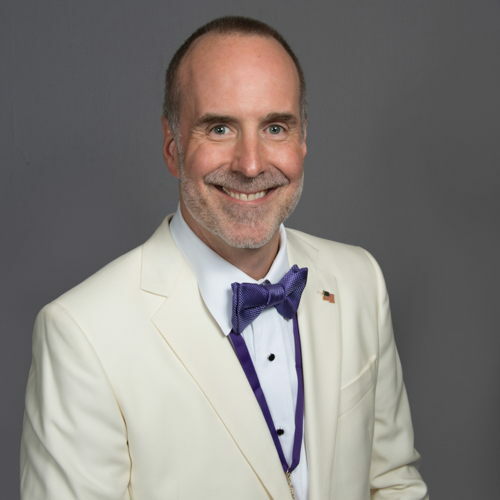 John Hancock was elected second vice president at the Orlando Karnea in 2016 and again at the St. Louis Karnea in 2018. He was first elected to the Arch Chapter in 2012 as secretary and then served as treasurer from 2014-2016. Hancock initiated into the Delta Rho Chapter of Delta Tau Delta at Whitman College in January 1984. He graduated in 1987 with a degree in political science. As an undergraduate he served his chapter as corresponding secretary, recruitment chairman and president. Hancock worked at the Delta Tau Delta Central Office as a chapter consultant, then as the Fraternity’s first director of leadership development, where he had responsibility for the launch of the Fraternity’s Leadership Academy and Adopt-a-School program. Hancock also served as the director of membership before leaving the Central Office after seven years. For the past two decades Hancock has worked for Junior Achievement and today is the president of Junior Achievement of Oregon. A native of LaConner, Wash., (near Seattle) Hancock holds a Master’s degree in public affairs from Indiana University - Purdue University at Indianapolis. He is a senior fellow with the American Leadership Forum and in 2010 was selected for an Aspen Institute Fellowship for America’s Emerging Nonprofit Leaders. Hancock lives in Portland with his wife Roodi.